Win a Rainbow Six Siege Year 3 season pass worth $29.99! The third season of Rainbow Six Siege Year 3 will soon kick off and it’s coming to us under the name Operation Grim Sky. After Ubisoft’s announcement we know that this next season will bring two new operators, a Hereford Base map rework, and gameplay enhancements that will be revealed the Six Major event in Paris across August 17 – 19. Now’s a good time to be an avid Siege player, then. If you’re not then we’re here to convert you – no, not by showing off our amazing attacking tactics, but with a giveaway. We have 24 Rainbow Six Siege Year 3 season passes up for grabs, each of which are worth $29.99 / £25.99. If you want to find out what exactly you get if you win one of these season passes then you’ll want to keep on reading. How you enter the competition can be found below, too. With a Year 3 season pass you get VIP status until January 31, 2019. 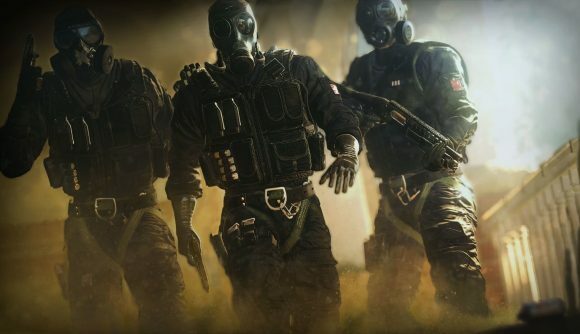 That gives you seven-day early access to the eighter new operators released in Year 3 – including the British defending police officer and precise American attacker coming in Operation Grim Sky. On top of that, you get a 10% discount on purchases made in Siege’s in-game shop with Renown or R6 credits, a 5% renown boost, a piece of exclusive headgear and an exclusive uniform for each Year 3 operator. Not stopping there, you’ll get a R6 Meteorite charm and an Alpha Pack boost (+0.3%), 600 R6 credits. If you want to win a Rainbow Six Siege Year 3 season pass then you need to enter the giveaway via the widget below. Every action you complete is worth one entry into the giveaway, with the more actions you complete increasing your chances of winning.